The work done by my colleague Dr Asier Unciti-Broceta and our ‘dream team’ has been published in Nature Communications. Asier proudly presents to the world the work done using his clever “bioorthogonal” method for activating a prodrug by palladium catalyzed dealkylation. What motivates us is to move towards the eradication of the side effects of chemotheraphy (e.g. depleted immune system, hair loss, tiredness, etc) in the very near future. This is done by focusing the cancer treatment only to the affected area. Like a ‘trojan horse’, in our vision we implant the engineered catalyst carrier first. 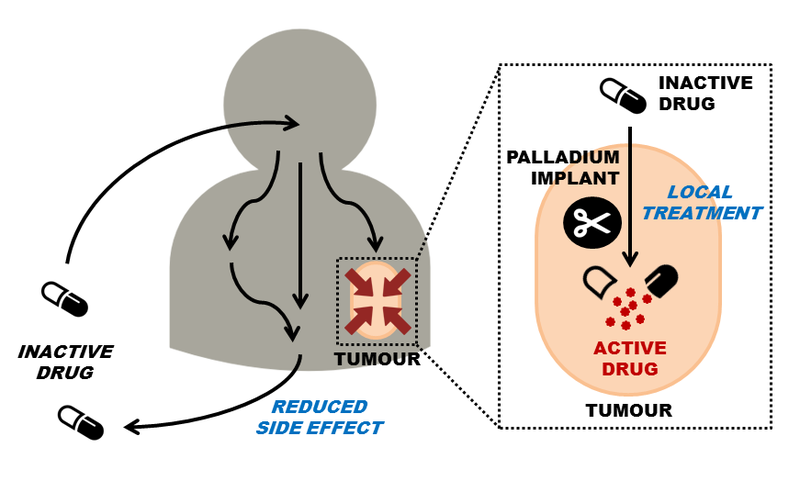 Then, by a selective activation via oral drugs, we produce the chemo-destructive effect with maximum effect on the targeted area, and minimal negative effects (i.e. death) on healthy tissue. The press release by University of Edinburgh can be viewed here. Asier is an academic fellow at the Edinburgh Cancer Research UK Centre at the MRC Institute of Genetics and Molecular Medicine, the University of Edinburgh.